M Large | ARE YOU THE HAKKI PILKE USER OF THE MONTH? You are here: Home / BLOG / News & Announcements / ARE YOU THE HAKKI PILKE USER OF THE MONTH? HAKKI PILKE FIREWOOD PROCESSORS ARE USED BY THOUSANDS OF PROUD USERS AROUND THE WORLD. USERS VARY FROM PROFESSIONALS AND SEMI-PROFESSIONALS TO SHARED OWNERSHIP AND PRIVATE USERS. EVERY MONTH A NEW HAKKI PILKE USER WILL BE CHOSEN AND PUBLISHED AT OUR WEBSITE, FACEBOOK AND INSTAGRAM. THE WINNER WILL BE ALSO REWARDED WITH AUTHENTIC HAKKI PILKE SOFT SHELL JACKET. 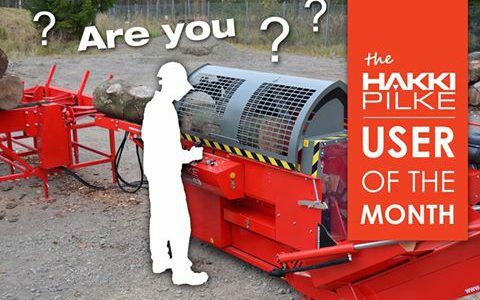 TAKE PART BY SENDING AN EMAIL INCLUDING A PICTURE OF YOURSELF TOGETHER WITH YOUR HAKKI PILKE FIREWOOD PROCESSOR AND YOUR CONTACT DETAILS (NAME, COMPANY, CITY AND COUNTRY, HOW LONG HAVE YOU BEEN HAKKI PILKE USER AND WHY ARE YOU HAPPY WITH YOUR PROCESSOR). http://demo.mlarge.com/wp-content/uploads/2017/01/mlarge-logo.png 0 0 clive http://demo.mlarge.com/wp-content/uploads/2017/01/mlarge-logo.png clive2017-02-03 11:27:232017-02-14 12:15:26ARE YOU THE HAKKI PILKE USER OF THE MONTH?